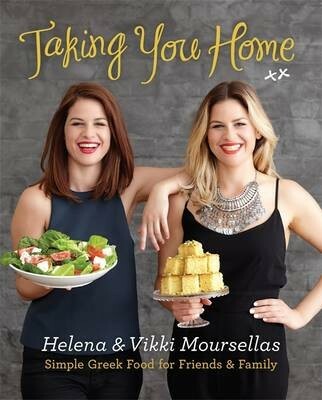 Identical twins and 2014 'My Kitchen Rules' finalists Helena and Vikki Moursellas take you home to the simple Greek food they love to eat with their friends and family. Nothing tastes better than a home cooked meal - particularly when it's a recipe that's been handed down from generation to generation. Helena and Vikki share their favourite recipes so that you can experience what it's like to eat at their Greek family table. From simple recipes for tzatziki and marinated olives, through to a beautifully slow-roasted pork belly and a twist on a classic Greek dessert like Sticky Baklava Fingers, this is a fresh new take on Greek family food. Each recipe is accompanied by a personal story and photos from the girls' own collection. Let Helena and Vikki take you home to the food they love to eat. Biographical Notes Identical twins Helena and Vikki Moursellas were 2014 finalists on Channel 7's My Kitchen Rules. Their Greek family food won the hearts of the nation and made MKR history with the highest home kitchen score - watched by millions of Australians. Helena and Vikki live together in Melbourne.